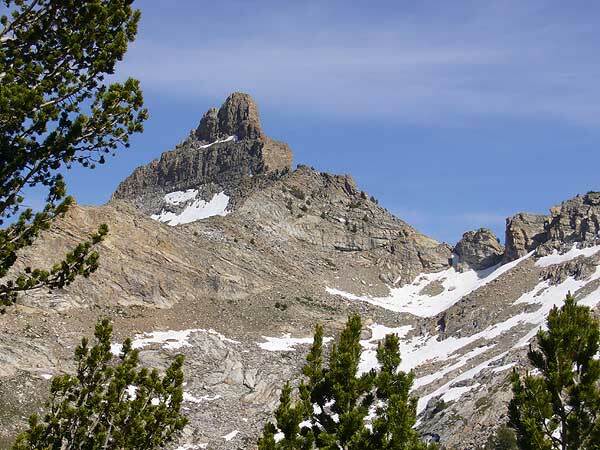 Allen Tatomer's annualy Ruby Rendezvous was an excuse for me to return to the Ruby Mountains. My first trip, in 2002, was to bag Ruby Dome. This time I hoped to see a bit more of the range. 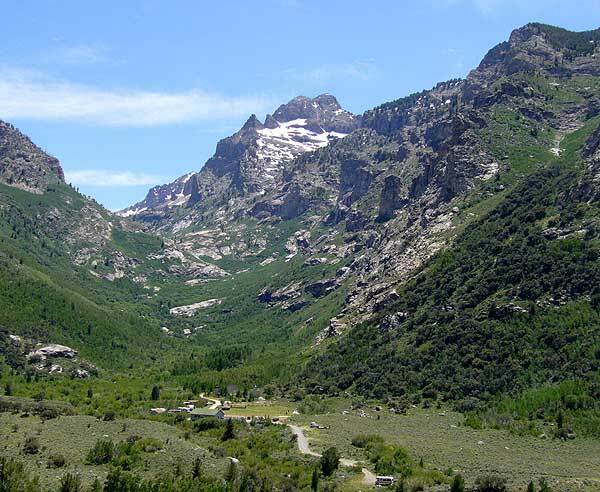 Lamoille Canyon is gorgeous (and paved all the way so be prepared for sightseers and an occasional bus). These mountains are more like the alps than desert peaks. Shorter than the Sierra Nevada, but apparently they get more snow. We camped in the Thomas Creek campground, the only public campground in the area (waypoint THOMCN). Allen had reserved a couple of sites, and the somewhat intrusive campground host kept coming around to make sure every car had paid. (The reservation says you can have two cars, but doesn't tell you the second car is not free.) We always had some sort of campfire, but due to a reservation mixup by the campground our sites weren't adjacent. One night we had entertainment - Sheryl Eve is a local singer who just happened to be our hostess at the local Basque restaurant (the Nevada Dinner House, where we all feasted on another evening). OK, so it was a car-camp trip... but we can STILL climb some peaks, eh? Not everyone went the same way, but my first dayhike with part of the group was up to Liberty Pass from the trailhead at the end of Lamoille Canyon (waypoint LAMCTH). We split up a couple of times, but four of us ended up at Liberty Pass and two of us ended up on Liberty Peak, the officially un-named bump west of the pass (waypoint LIBERT). A swell view but sort of a short day convinced us to follow Liberty's north ridge down to the saddle above Lamoille Lake. Steep but reasonable, I highly recommend this loop. I also got in a couple of standing glissades on the snowfields leading into the lake (far left in the picture below). The next day three of us (including late arrival Lori) headed up to Island Lake from the same trailhead (waypoint ISLKTH). At a suitably stunning outcropping above the lake my companions called it a day while I scrambled on up to the high point of Thomas. 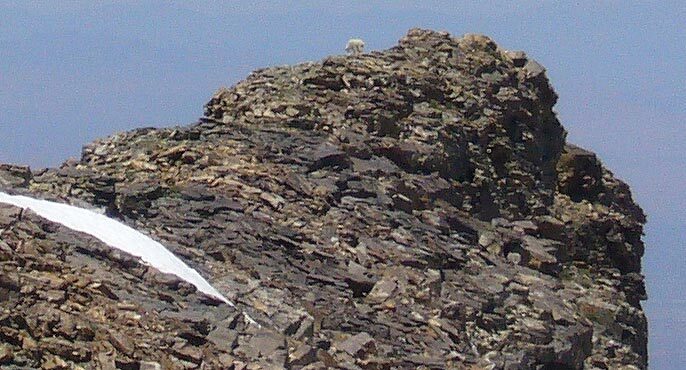 I wanted to also visit the named summit, but a mountain goat browsing there kept me away. An easy day but we weren't here to set any records. Rangers say there are no goats, but this ain't no sheep! By now people were drifting away from the group, I was acclimatized and itching to climb a real peak, and it turns out Lori had brought a backpack also! We settled on a cross-country loop up Thomas Canyon and down the Right Fork of Lamoille Creek, hoping to bag Fitzgerald on the way. Allen assured us the saddle between the two drainages would work (and it did). He also remembered climbing the 'easy' west ridge to the summit (which was anything but easy). 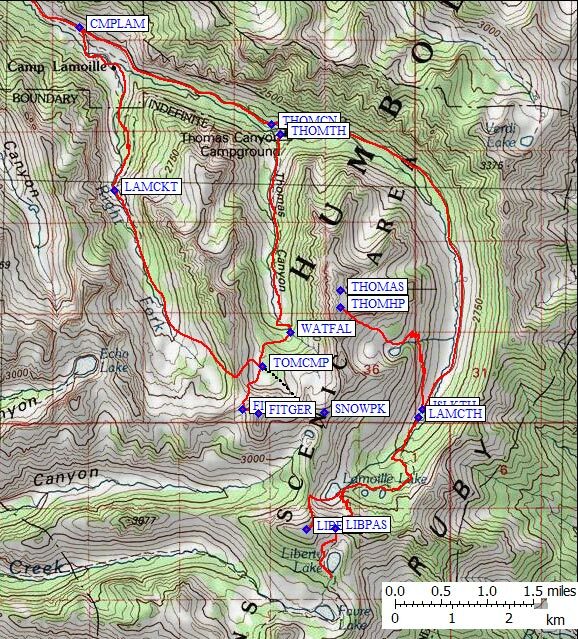 We started at the Thomas Canyon trailhead (waypoint THOMTH) on a good trail that lasted a mile to two. Soon we were crossing the stream to avoid brush and wondering if Lori should really be doing this with her recently-injured shoulder. The terrain opened up a bit and a use trail periodically appeared. The canyon felt very different than the Sierra Nevada, with a granite base layer having pushed up volcanic or sedimentary layers, forming very steep walls. We had lunch at the base of a waterfall while trying to figure out how to get around it. Brush thrived in the wet rocks, so we detoured far to the east around a second waterfall and eventually scrambled up loose dirt. We entered a higher bowl (near waypoint WATFAL - see detail map below), and traversed the the highest tarns through increasingly alpine terrain. We camped (waypoint TOMCMP) near slow-moving streams, tarns, barefoot meadows, and sunning slabs. No bugs, no clouds, no frost, this was living! Just after dawn the next day we headed up to the ridge northwest of Fitzgerald. Lori elected to stop when the boulders got to the size of refrigerators and it became clear we'd need ice axes and crampons to reach the mountain's west ridge. I kicked up a snow chute to waypoint FITSAD, and was soon on the easy west face of Mt Fitzgerald. Easy is not a permanent state in the mountains. 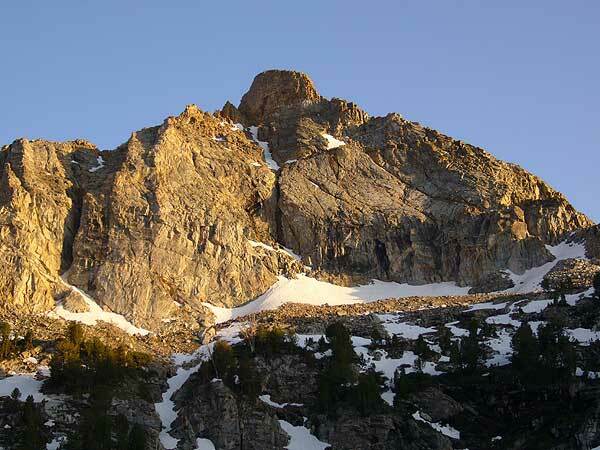 As I neared the summit area, a 50-100' band of cliffs became increasingly daunting. That's the steep sunlit part on the right of the summit mass in the picture above. The cliff band had few defects, and it was obvious this was NOT the class 2 route Allen had described. 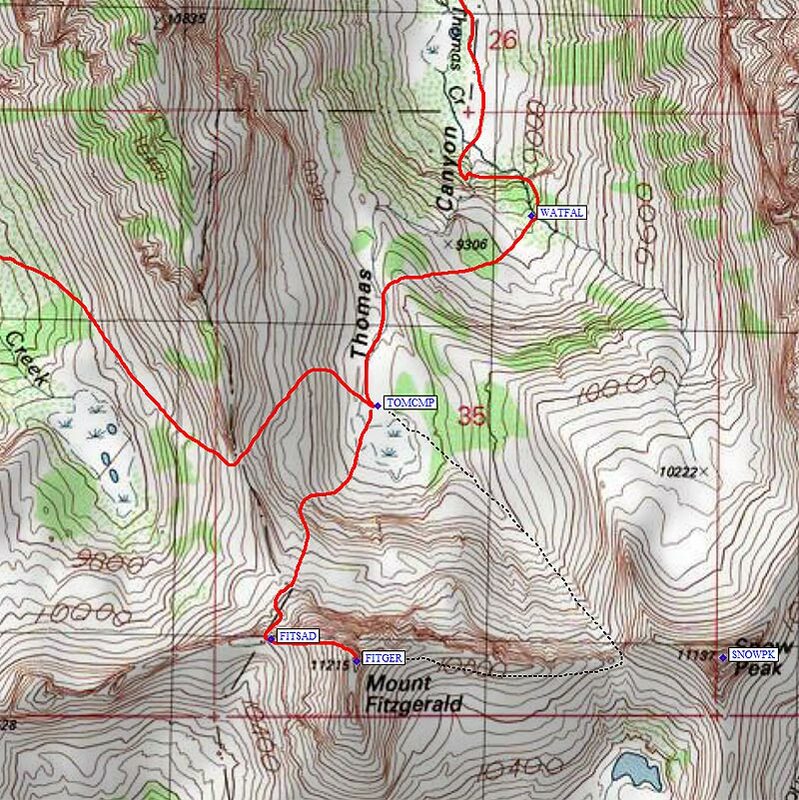 My guess is he followed the black dashed line in the detail map below, going to the Snow Lake Peak saddle and climbing Fitzgerald via its east ridge, but I can't be sure. All I know is the west and south sides look way harder than the east side, and the north face is class 5. So I stupidly pressed on. The holds were good but not as secure as granite, the exposure was extreme, I was alone, I had no rope, and I didn't want to go back down the 30' I had already gone up. So I didn't look down and soon the angle lowered to something resembling class 2. Lori heard my whistle, my cell phone worked, and I took this picture of our entire route. The slabs and tarn where we camped are in the lower right corner. I had climbed very near the ridgeline, but I descended into a 'pocket' and traversed north back to the base of the cliffs. (When climbing, you could follow the ridge until you hit the cliffs, then climb up and right into a defect, where the exposure is less and the holds are less vertical... but finding a good way from the defect to the ridge was easier going down than going up!) Lori and I went back to camp, got our packs, and headed over the ridge into the Right Fork drainage. This drainage looks the same in pictures and on the map, but it's not! Thomas Canyon is prettier and less brushy. We sometimes bobbed and weaved, we sometimes bent over the brush and pushed downhill, we sometimes crossed the stream and climbed up the other side. Tough going, and we were losing the sun! Finally, somewhere around waypoint LAMCKT, we picked up a real trail. This was quite fortunate, because below 8k this canyon is choked with brush, trees, deadfall, and almost tropically lush undergrowth. Beavers love it here. Their drag paths cut across the trail and went straight down into the water. Apparently they had already killed every tasty tree near the stream, and were now deforesting the hillsides also. That, or the Boy Scouts using Camp Lamoille were out practicing with their hatchets. We ended up losing the trail when it got near the camp, so we followed a fence line to where Lamoille Creek forks and wading the Right Fork at an established ford. This led us up into a parking lot, and we got to the car we had stashed outside the camp just before flashlights would have been required.